The Lowepro Versapack 200 AW combines a fast access camera compartment with a handy personal storage area into a light, all weather backpack that's perfect for an afternoon outing. My typical set up with this pack starts a 70-200mm zoom on a DSLR in the bottom, quick access area (it's quick access because you don't have to remove the pack to retrieve your camera, just reach around, unzip the pocket, and grab your camera). I keep a wide angle zoom in the top pocket, along with a jacket, protein bar, and whatever personal accessories I need. Maps and other papers store nicely in the front documents pocket. And if I'm on the trail, I hang a water bottle from the chest strap. For such a light pack, the suspension system is very comfortable. I can literally wear it all day with no neck or shoulder strain. If rain is in the forecast, the hidden all weather cover can be pulled out to protect the entire pack. 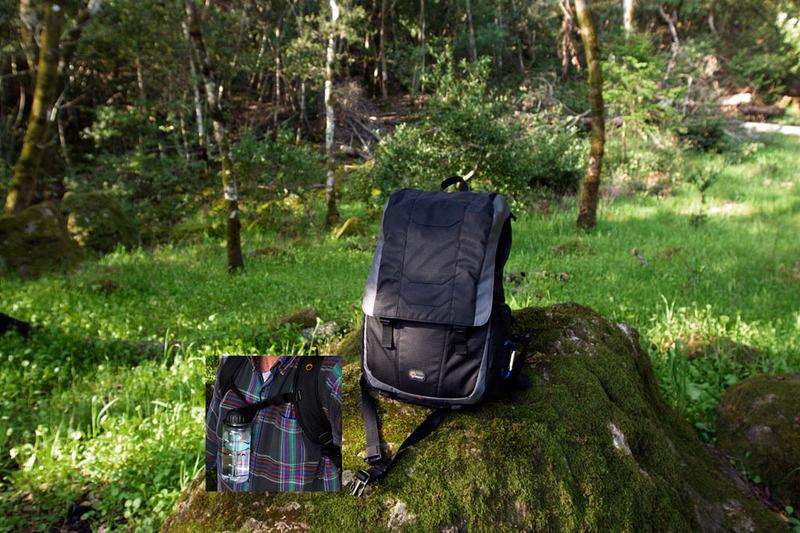 The two bottom straps work great for a tripod, ground mat, or rolled up jacket. The internal foam protection dividers can be removed from the Versapack, allowing you to fold the entire unit flat to store in a suitcase for travel. When you get to your destination, insert the dividers, and you're ready to explore. The Lowepro Versapack 200 AW retails for $99.95 . When you're taking pictures in the great outdoors, your footwear is just as important as what's in your photo bag. The last thing you want is to be distracted by sore feet, or worry about your footing on uneven surfaces. I've tested some reasonably priced gear that you might want to consider for your next big outing. The Merrell Moab Ventilator boots don't feel like traditional boots in terms of weight and comfort -- they are as light as many athletic shoes and feel just as good... except they provide wonderful support and traction on the trail. 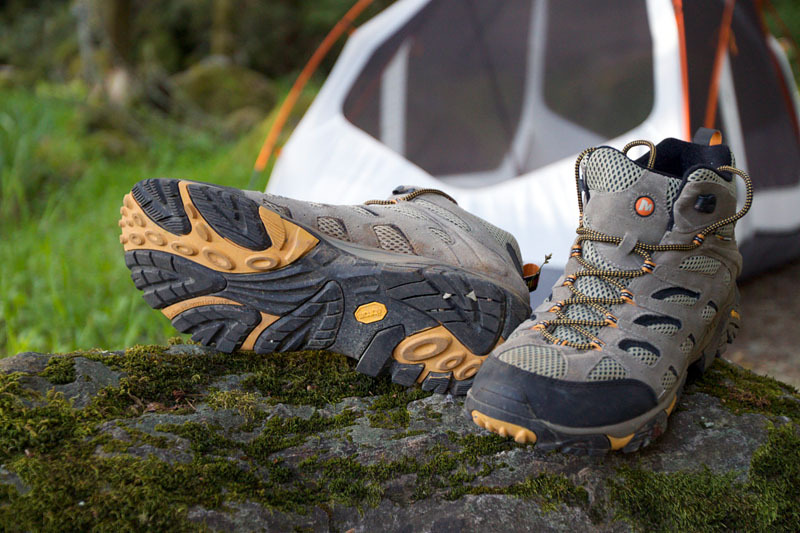 I've worn these shoes with backpacks, photo packs, up hills, down hills, crossing streams, and around camp. And I'm never in a rush to take them off. The Moabs breath well to keep your feet at a comfortable temperature. I usually wear one pair of hiking socks, and that's all I need. If you like to wear very thick socks or double pairs, I would order up a size, or at least a half size for the Moabs. Merrells do not run large for their listed size. So if you normally buy size 12 in your training shoes, you might want to try size 13 for the Moabs. The Merrell Moabs run about $85 retail . So they are a good value as well as a comfortable, versatile boot. When you want total comfort, easy on and off, yet great tread in case you have to sprint off to grab a shot, you might want to look at these Keen Newport Sandals . Typically, I wear these Keens around camp and, quite honestly, with shorts most of the summer. 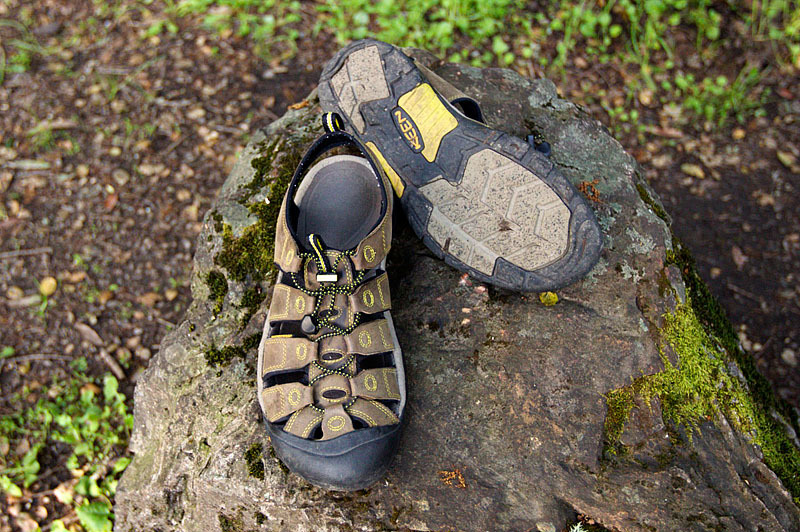 But I've also tested them on day hike with reasonable terrain, and they, along with my feet, have held up just fine. When I do day hike in them, however, I wear ankle socks for added comfort and to wick away moisture. The Keen Newport Sandals run about $75 retail, but I've had a pair for well over a year, and they are definitely built to last. After two days of investigating photography apps in iTunes for the iPad, the two downloads that impressed me the most were Apple's own Keynote (rewritten for the iPad) and an iPhone favorite: CameraBag. Keynote is far and away the best presentation tool for building photo presentations on the iPad. And the developers over at Nevercenter.com have added some nice touches to CameraBag for adding effects to images in your iPad albums. I've been adding images to the iPad from a couple different sources. The first from Aperture vla a Smart Album that iTunes can see during syncing. The second is using the download image option in Flickr. I've been saving my photos to Flickr at 1024 on the widest side, which works out great when I download them later to te iPad. I'll cover these two apps, and photo workflow on the iPad in more detail soon. But if you're working with the device right now, I would take a look at these applications. Compact camera zoom lenses often don't have the "reach" we'd like at the telephoto end. If you shoot at your camera's highest resolution, you can actually extend its reach without compromising quality. Here's how. This video is from my Lynda.com training titled, Getting Pro Results from a Compact Camera. You may also want to watch these free tutorials. More Free Photography Tutorials Compact Camera Scene Modes - A tour of the most important scene modes on a compact camera and how to use them. Sunglasses Polarizer - How to use your sunglasses as a polarizing filter for your compact camera. When you first look at the specs for the Canon EOS Rebel T2i / 550D , you might think that Canon can't provide 18 megapixels resolution on an APS-C sensor and control high ISO image noise and price the body at $799 US. And you would be wrong, because that's exactly what they have done. You know it's a serious camera when Digital Photography Review says in their exhaustive report on the T2i/550D, "The unavoidable fact is that to get the most out of the 550D's sensor you really need to pair it with Canon's better lenses, which is a considerable investment." Then go on to say, "That said, the bottom line here is that the EOS 550D offers excellent image quality in a range of different conditions, including exceptionally low light, thanks to its usable ISO 12800 setting. Image quality is equal or better than its predecessor the EOS 500D, and not noticeably inferior to the considerably more expensive EOS 7D. The 550D's video capability is excellent too." Yes, so the upshot is for enthusiasts photographers with good glass, or pros looking for an affordable back-up camera that delivers high quality results, the new Canon EOS Rebel T2i is a pro tool with a consumer price tag. When you're working in the field for a day or a week, having dependable shelter improves the experience. Photographers need a place to relax for short breaks, work on images, store gear out of the elements, and if necessary, sleep. I've been testing the REI Half Dome 2 tent ($179), and it has become an essential part of my outdoor gear. Photos by Derrick Story. Click on image to enlarge. This is a tent that has stirred lots of discussion. It earned a Backpacker 2010 Editor's Choice Award for great value, yet many readers on REI's own site panned its construction for condensation, difficulty to set up, or for just not liking the new design in general -- none of which ever crossed my mind when using it in the field. I can set up the Half Dome 2 in just a couple minutes. I think the design is terrific for creating shelter in a hurry. 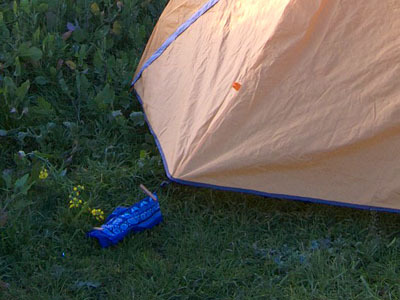 I use the tent in two modes: with and without rain cover. When the weather is nice, I prefer without rain cover and let the mesh separate me from the insects. When it's time to add the cover, open the top vents, then pull the rain cover sides out and stake them. By doing so, you increase ventilation, and create two additional storage spaces outside the main cabin of the tent, but still under the rain cover. If rain is in the forcast, you may want to close the top vents. I also bring a half dozen clothes pins and a few colorful bandanas. I pin a bandana to each tie line on the side of the tent so other campers don't accidentally trip over it. The "patio" created by this configuration is great for keeping your boots out of the elements, yet not having to store them in the main cabin. The Half Done 2 has doors on both sides of the tent, so you can have a "back patio" and still keep the entrance clear. The floor dimensions in the main cabin are 88" x 52" and very roomy for one, but a little tight for two guys. Since the tent weighs-in at 5 pounds, I usually prefer to carry it just for me, even on backpacking trips. This means I have plenty of room for my long sleeping bag, my pack, and various pieces of gear. There are also four interior side pockets for small items, and two top loft compartments that I use for LED lanterns. This makes it easy to continue working long after the sun goes down. 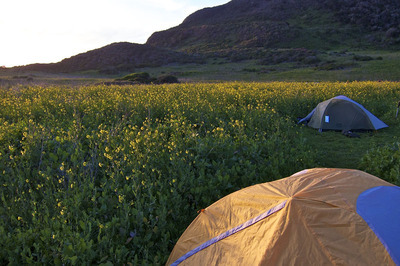 If you're looking for an affordable, relatively light, practical shelter for outdoor work, I would put the REI Half Dome 2 tent on my short list of considerations.